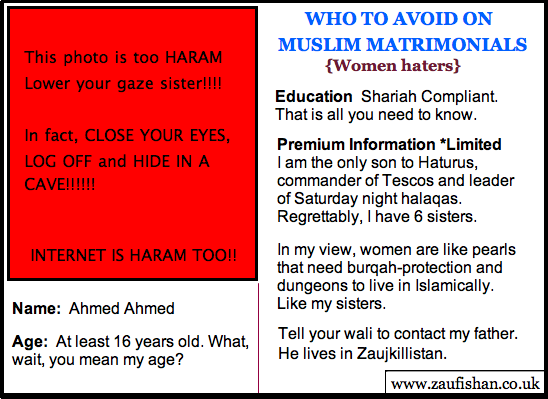 I have come to the conclusion that online Muslim marriage sites are overrated. 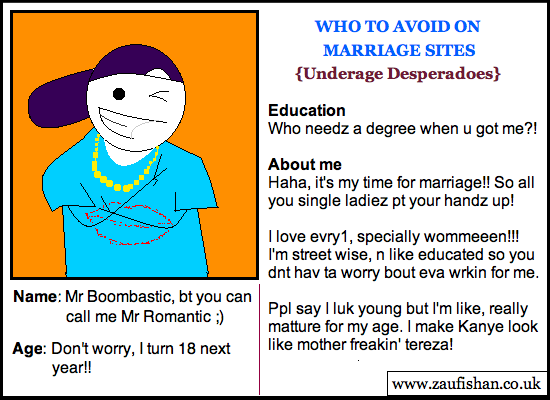 If you however, are registered with a popular matrimonial site and you're doing well, good for you, alhamdulillah. Assumptions are dangerous, but I assume you began with holy intentions, you got your family involved (because you're a woman) and you've sent loved up messages with various prospects every hour. There's even several potentials and now you're considering polygamy (because you're a man). However. On the other side of the screen is a person you're never going to really know unless (a) you meet them, (b) you meet them, or (c) you meet them. Thus, to prevent flipping out, I have listed the top 6 brothers you must save yourself from. 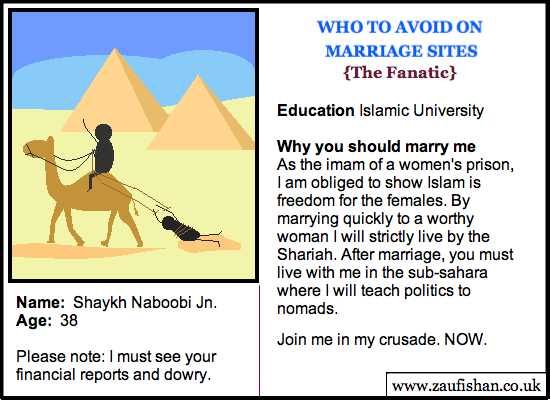 I respect and encourage using the Half Our Deen and Pure Matrimony marriage sites. The first is a Baba Ali (Ummah Films) creation while the other from Mercy Mission carries a stronger "Islamic" Card. 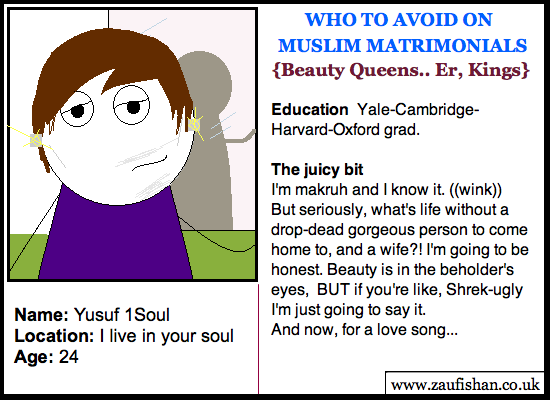 And there are others with lesser 'halalified' statuses although equally successful, Single Muslim, Qiran, and Shaadi.com. 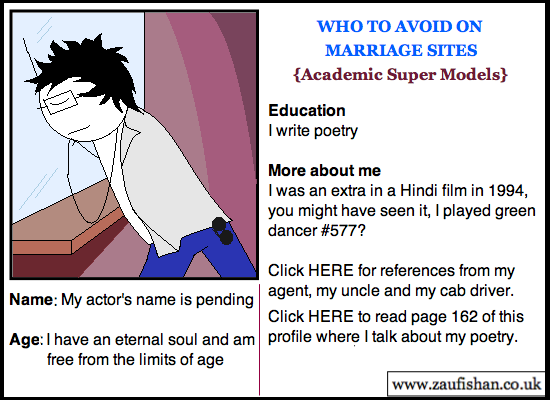 Read the Saif and Zaufishan story on Shaadi.com-(I didn't know either). What none of these sites tell you is that people are the same weirdos everywhere. Granted, the "quality" of members is going to differ from a Muslim-only matrimonial site to a public chat site with halalified flirtathons. Some men genuinely do want to find their other half. The rest of them are la-hoo-sa-hers. 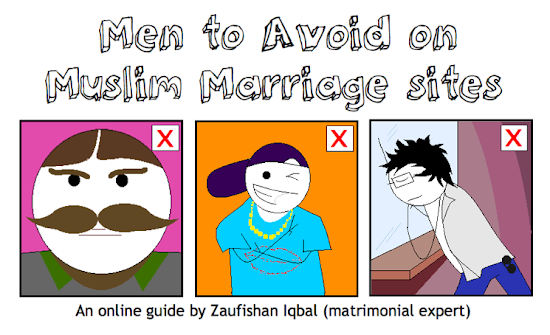 Here's a visual guide on which Muslim men you need to avoid. See a profile that looks freshly deported from a war torn country? That's a visa disaster waiting to happen. You struggle to read ridiculous misspellings to learn he's a military technician, and wants to liberate some plot of land using skills he gained from a suspicious training camp. Throw in a scary passport profile photo that you're sure was listed on Interpol's Ten Most Wanted, and clicking on this person's profile alone sets off the house burglar alarm. 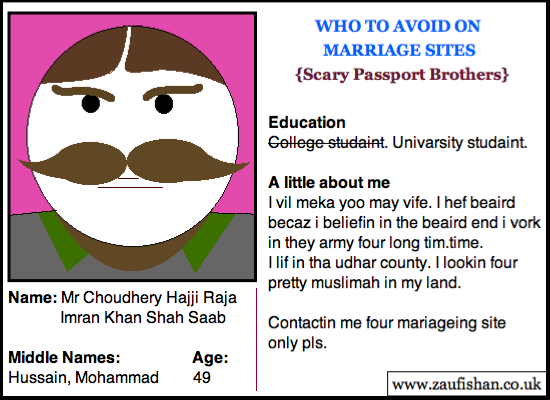 He can't get married, he's illegal in five-sixths of the world. Avoid. Stay clear of anyone whose personality doesn't just sound desperate on the site, it jumps off the screen to strangle you. He says older women are his "thaing" and he's "like, a really sensitive guy". He's seen Titanic twice. He opening message is so endearing, "OMG, you need to introduce me to your parents 'coz I'm da bomb, lolz". After a quick analysis you figure out he's a pubescent man-boy who wants to be a gynecologist and refers to women as chicks, ladiez and babes. Ego is workable in small amounts. This brother needs a strong reality check. Avoid. Occasionally, buried among the tolerable members, one Muslim brother surfaces from the far East who thinks he's "all that", when in actuality he's about <------this much------> of all that. Masha'allah, these "wannabe models" brothers try, too hard. The 'about me' section on his profile explains, "*sigh* I hate talking about myself, I'm not happy there's not enough space here to express my deepest inner thoughts with high articulation without misleading anyone about how humble I really am..." and then provides a monumental thesis on the most important things in his life, including his favourite place to watch traffic in Karachi. This brother has his heart in the right place, his head however, is in Karachi. Avoid. Avoid the man who feels a five minute conversation pre-determines your future. 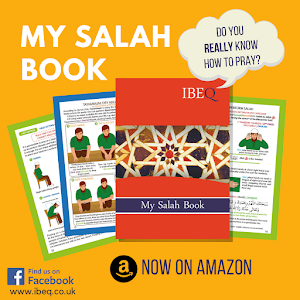 He speeds through communication to fast-track the nikah and compares marriage to a race. That's because he's already married. Shortly after the initial salamings, small talk and duas, he's already asking for your IM address, Twitter username, phone number, work number, favourite take-out, and for you to tell your wali about your engagement. Dude, that is not where I parked the car. He has not fully understood the process to a Muslim marriage. Or maybe he's more into the wedding night. Use protection. Avoid. Men need to lead. Men like to know they're number one. But don't even try to negotiate with brothers who want you doing things "their way". They ignore your individuality from Allah and thoughts. Why? "Because, shut up, I said so". You need a government official just to ask how his day was and a swipe card before mentioning yours. Shifty and stubborn. If he could, he'd delete all female members from the site to remove fitna and ship them to misogyny land. It doesn't matter what predisposition makes him demand these things, gently tell him you belong to Allah, not him. Avoid. You must keep away from the brothers who base their marriage criteria ONLY on physical attraction. They will use science to justify this; "If my DNA neorochemistry is not sparked by your phenotype it means I'm not attracted to you and therefore you aren't beautiful to me." This man is in it for the photos and flirtation. He hasn't told his family and thinks that's cool. He wants your body, he wants your babies, he wants you to burn up for him. While smart Muslims know that attraction plays a part in all relationships, Muslim marriage is not all about what's underneath the jilbaab. If all he sees is your what you do to him, avoid. Possibly my favourite of the pack, the fanatic has never heard 'no' in his life. Religiosity and reigning over a small country has created this dictator, who also looks likes a violent Danny Devito on steroids. He attaches a spreadsheet on his online profile that lists in alphabetical order what he wants in marriage, when he wants it, how he wants it, and what it needs to be gift-wrapped in. 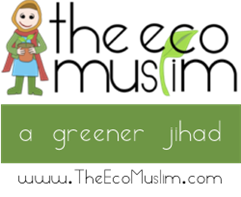 Watch out for red flags like "my wife must wear niqab, my wife must live with my 15 in-laws, I want my wife to have 4 children, 2 boys, 2 girls and all in the first 5 years." Before he takes you down with him to a place women can't drive, avoid. To conclude, if you're a successful online marriage story, may Allah bless your union. I already made printed marriage dua cards for your ceremony. And should you be the unfortunate seekers dealing with oddities of single lonely men, take caution. OH MY! This was HILARIOUS! Sad, but so true to life and thus, funny! Seriously though, I think it is brave for people to look on these sites, though yes, it seem slike Baba Ali's doing a great job, as I've heard many have found their other half with the help of his site's services, ma'sha'allah. I feel fortunate to have extended family and family friends that would be willing to search/suggest people if the need arose. "people are the same weirdos everywhere." Would love to hear a man's take on the online marriage site situation. I also have heard the same about Half Our Deen. If I am not mistaken almost 200 found their other half! Mashallah. I was on the site before I found my other half and I also faced people like the above mentioned in this article. One person was trying to make me his 4th wife but I reported him. I was on HOD before I found my other half and I also faced people like the above mentioned in this article. One person was trying to make me his 4th wife but I reported him. It is very difficult as we wil always face these kinds of people sites, some more than others. We need to know how to use them and what to look for. Thankfully Baba Ali's site has some features that give you that indication immediately. This was such a worthless waste of time. You should really reconsider your outlook on life before you ever post or write anything again. true about completing half your deen when you get married. It is one of the main parts of your marriage.